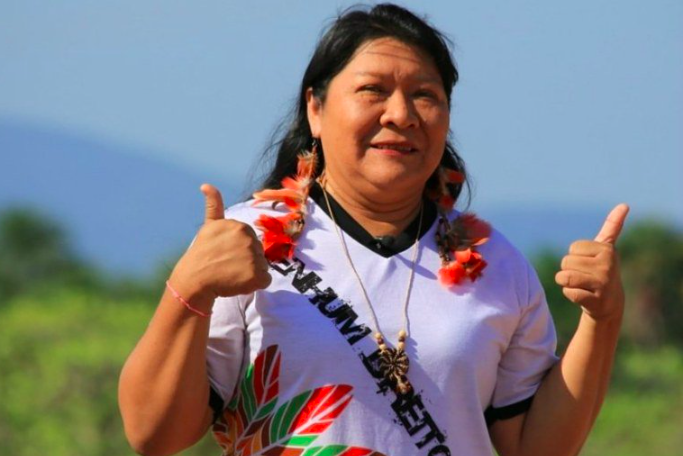 Joênia Wapichana has been elected as a federal deputy in Brazil, the first indigenous woman to occupy the position in 194 years of history of Parliament. She is a a lawyer, 43 years old, and was elected with more than 8,000 votes. “Everyone has a mission in life. Mine is to defend indigenous collective rights,” she says in her Instagram account. This is the second time that an indigenous is elected to the Chamber of Deputies. The first was Mário Juruna. Among the cases that she can defend as an elected Federal Representative are indigenous collective rights, the struggle for indigenous women, sustainable development, respect for the environment, transparency, ethics and the fight against corruption. In an interview with the Indigenous Missionary Council Joenia reiterates the need to demarcate indigenous lands by FUNAI [National Indian Foundaion] based on the criteria of the Constitution. As a strategy, she intends to begin her mandate as a member of the federal government, to devote her work to combat anti-indigenous proposals and to listen to all proposals considered as priorities by organizations and entities that defend indigenous rights. Through dialogue with indigenous peoples and organizations, Joênia intends to propose a system of indigenous school education of its own, to have laws that recognize indigenous professionals in other areas, and also in the long term to develop specific public policies for youth and women, in addition to working on sustainability and partnerships.